The simple rubber (or elastic) band is one of those nifty little items that costs next to nothing and yet has so many uses. There's always a bag of them in our junk drawer, and I also make sure my office drawer has a plentiful supply, too. But just how versatile is that modest rubber band? Well, I thought I'd do a little digging. Myscha listed 8 great ones already. I have my own uses of course, and they represent a good chunk of the following list. But I wanted to know how other people use them. I was genuinely surprised at some of the responses I got. 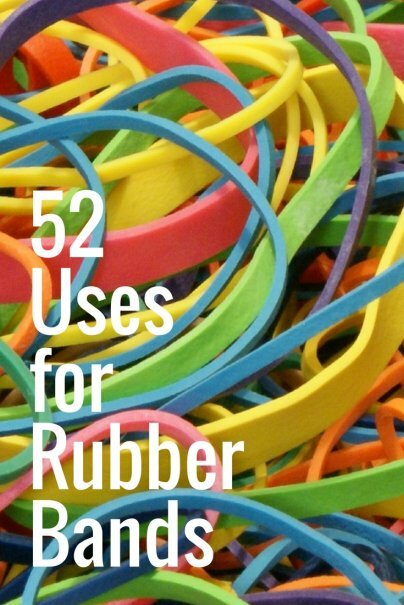 So here then are 52 uses for rubber bands, ranging from the tiny one that hardly fits over a marker pen, to the giant one that you swear could double as a timing belt. 1. A hair tie. Something I still remember from my days in the mosh pits. In college, when money was tight, I didn't want to blow money on hair ties. A simple rubber band does the trick, but it can take a few hairs with it as you pull it out. 2. A diversion. So, you want someone to look the other way, maybe so you can sneak out, hide a present or just pull a prank. Fire a rubber band across the room and aim for something that will amplify the sound as it hits. As your victim turns to look, move and strike. 3. An eraser. Hey, it's made of rubber after all. Grab a few rubber bands and create a small rubber band ball. With enough rubber bands, you'll have something sturdy that can erase pencil just as well as your standard eraser. 4. A sports-glasses holder. If any of you have to wear eyeglasses but play sports, you'll know how annoying it is to have your glasses fall off, especially as the action heats up. Simply cut a rubber band in half and attach each end to each arm. If you have made it tight enough, the glasses will cling nicely to your head without pinching. When the game is over, just cut it off and throw away. 5. An eyeglasses safety strap. Same as above, only make it much longer. Now, if you have to remove your reading glasses, your new safety strap will let them hang neatly on your chest until you need them again. 6. A poster scroll. Perhaps the most obvious use, but still worth mentioning. Simple slip a rubber band over a rolled up poster to keep it rolled up. BUT, not too tight. It will leave indentations that will run the full length of the poster if the rubber band is too small. 7. A handle grip. Easy enough. Just wrap several wide rubber bands around the end of a pole to create a comfortable grip. I used this method to make a hiking stick more comfortable. 8. A mafia wallet. Well, not just the mafia, but a lot of wiseguys don't like to carry wallets. Instead, they use a money clip or in some cases a rubber band. Wrap it around your stash of Benjamin Franklins. Or, if you want to contain your ID as well, put the cash between your driver's license and credit cards, and then wrap the bands around that. 9. A humble reminder. Just put a small rubber band over your little finger (not too tight mind you) to act as a reminder for something important. That’s if your smart phone is a piece of junk that has no calendar. 10. A candle dewobbler. Is your lovely candle wobbling in the candle holder? Just put a rubber band around the base and it will fit nice and snug. 11. A glove softener. We’ve all done it, or at least, most young baseball players have done it. A brand new glove is stiff, so after beating it with a mallet and rubbing in shaving cream, wrap a big rubber band around it. Then let it sit. 12. A mail storage system. Hammer two parallel rows of nails in the side of a cabinet or the back of a door, and stretch rubber bands between them to hold mail. You can also stretch bands over a piece of plywood for a cheaper version of the French ribbon board. 13. An overbite cure. I’m skeptical on this one. But apparently, when stretched between opposite ends of the upper and lower jaw, over a period of time, the force of a rubber band can correct a minor overbite. 14. A remote control saver. Wrap a big rubber band around the top and bottom of a remote. It will protect it from a fall, and it will stop it scratching up the coffee table. 15. An Easter-egg decorator. Just wrap rubber bands in different directions around the eggs before dunking them in egg dye. Cool patterns will appear. 16. A cheap ruler. For this one, use a bigger rubber band, stretch it out and run your pencil along it. Simple, but certainly not perfect. 18. An electrical insulator. Make wires safer in an instant. First, turn of the power, then wrap a rubber band or two around any exposed wire to protect yourself. This is a temporary measure obviously. 19. A finger exerciser. If your fingers are in need of some stretching or rehab, this is a cheap way to work them out. First, bunch all of your fingers together and place them through the center of a rubber band, one with a lot of tension. Next, spread your fingers and let them contract.Now, repeat. 20. A flower arranger. For simple organization of your blooms, use a rubber band to keep flower heads together. Cut the stems to just above the height of the vase for best effect. 21. A lid gripper. Don’t pay one cent for those expensive lid grips you see advertised on late night TV. Instead, wrap a thick rubber band around the rim of a jar lid and then twist. 22. A shirt loosener. Is your top button a bit tight? Don’t pay for expensive adjustments. Put a small rubber band through the buttonhole, then loop the ends over the button. 23. A bed slat securer. Got a few loose slats under the mattress? Just wrap a few rubber bands around the ends to make them more secure. 24. A caster tightener. We all know that furniture leg casters can take some punishment and become loose over time. To tighten them up, wrap rubber bands around the stem and reinsert. 25. A wine marker. Wrap a different colored rubber band around the stem of each glass the next time you have a dinner party or gathering. No more mixed-up drinks. 26. A Koosh ball. Take a whole bunch of rubber bands, and them hold them together with one very strong rubber band. Now cut through the ends of the rubber bands and you have a homemade Koosh Ball. Really cheap and fun. 27. A liquid marker. If your garage is anything like mine, it’s filled with all kinds of containers, most of them holding something like paint, turpentine, cleaning fluids and more. But which ones are full, and which ones are ready to replaced? You can use rubber bands around the outside of the cans as guides, and move them down the can as you use more. 28. A paintbrush scraper. Speaking of paint, I usually wipe the excess from my brush on the inside rim of the can. But this leads to paint leaking into the rim, splattering you with paint when you hammer the lid back on. To avoid this, wrap a rubber band around the can from top to bottom, going across the middle of the can opening. Now you can just tap the brush against the rubber band and the excess paint will fall back into the can. Nice and neat. 29. A universal object gatherer. So, so obvious but how can I not mention it. From pencils and pens to index cards and office supplies, a rubber band is invaluable in keeping objects tied together. 30. A sliced apple keeper. Odd but true, if you slice an apple into wedges and then put them all back together, a rubber band wrapped around the apple will hold it all together and stop the wedges from yellowing or drying out. Much better for the environment than using sandwich bags. 31. A bag sealer. Keep chips, cereal and other bagged produce fresh by folding the top of the bag over and then wrapping a rubber band around the whole thing. 32. A folder sealer. Manila folders with loose folders inside could use something to keep all those papers from getting out. No problem. Wrap a rubber band around the length and width and they'll go nowhere. 33. A wire sorter. Especially useful if you have a large collection of wires under your computer, keep them organized by wrapping the excess with rubber bands. Color codes rubber bands can also help identify the different wires. 34. A toddler lock. Young kids love to explore in those cabinets under the sink, and everywhere else. Stretch strong rubber bands tightly between cabinet knobs to lock them in place. 35. A broom reviver. If the broom's bristles are looking worn, tighten them up by wrapping thick rubber bands halfway up the bristles. 36. A toilet paper saver. My cat just loves unraveling the toilet paper. And then shredding it. To avoid this, wrap a rubber band around the end of roll of toilet paper. Can be annoying to remove each time, but if you find wasted paper more annoying, try this. 37. A last resort glue. Seriously, this is last resort. But if you need an adhesive in a hurry and can't get to a store, melt a rubber band onto the object you want to stick. It works! It's not super glue, but it's a good temporary fix. 38. A bottle holder. Shampoos and lotions can be slippery in the bathroom. Wrap a large rubber band around each bottle and you'll never have a problem keeping your grip. This also works on any other bottle in any room of the house, and is very useful for people who have trouble gripping, especially those with arthritis. 39. A spoon saver. How often have you seen the spoon fall into the soup or mixing bowl? Just wrap a rubber band around the upper part of the spoon’s handle, right above the point where the spoon touches the rim of the bowl. No more slipping and sliding. 40. A quick tagging system. Are some batteries older than others? Are some pens more reliable, or do they belong to different members of the family. Color-coded rubber bands can help you sort them all out quickly and easily. 41. A pencil grip. Wrap many rubber bands around the base of the pencil, or pen, where you like to hold it. Now it's much more comfortable, and less slippy. 42. A slingshot. You know how to make it work, I won't spell it out. But for catapulting a small object from one side of the room to the other, a rubber band is ideal. 43. A quick splint. If you need to strap in injured finger, use a rubber band, or bands, to firmly attach a stick or strong piece of card to the injury. 44. A lid securer. Again, another obvious but great use. If the lid is loose and past its prime, keep it in place with a strong rubber band. 45. A cord shortener. Don't trip over long electrical cords. Simply wrap a rubber band around the excess to shorten them. 46. A work of art. Anyone remember string pictures? This is the rubber band "ghetto" version, but it's quick and easy. Just by using a pegboard and rubber bands you can create cool shapes and patterns, and it's cheap, too. 47. A wax catcher. Wrap a large rubber band around a candle and it will stop the wax from dripping onto the table. 48. A cutting board anchor. If the board is sliding on the counter surface, wrap a rubber band around each end. Now, it will hold steady as you cut. 49. A rubber thimble. If you have to count or shuffle a lot of papers, a few rubber bands wrapped around the tips of your fingers will make the job a lot easier. Again, not too tight. 50. A stress reliever. Make a ball from lots of rubber bands. You can squeeze them when you're feeling stressed, and it's cheaper than an off-the-shelf ball. 51. A leak fixer. A very temporary measure, but a strong, fat rubber band can be wrapped around a pipe or hose to slow the leak. 52. A tie dye tool. How many hippies out there remember this? Tightly wrap rubber bands around your clothing item, in several places, and then place into the dyes. Nice. Well, that's all I could either think of or find. It should be more than enough to keep you going for now though. And if you have any other uses not listed here, please list them in the comments. You forgot the most important one! This is extreme frugality, in all its glory! With a list of 52, most people should be able to find one or two that they could apply. As a bag saver, these do work well. This post comes just in time. Rubber bands are starting to take over my kitchen junk drawer ;)! Thanks for the great ideas. When I was a kid, we tied them together and made a big loop we called a "Chinese jumprope." If you don't remember how to play, you can find the different step patterns online. Now I use rubber bands for freezing. I brown ground beef and drain it, or cut up leftover chicken or turkey, then apportion it into small plastic bags (usually the ones that used to hold frozen vegetables), then fold them tightly and secure with rubber bands. Later, when I want to make chili, I pull out a bag. I use a rubber band to hold my wallet closed. Its snap is faltering, so I wrap a band around the whole thing. Thick rubber bands can be used as temporary labels by wrapping them around your object---like a jar---and writing the contents with permamarker. i just want to add one on the list! You can use rubber bands to throw cards! well, it is not necessary but it is kinda for entertainment purposes. I have two good ones not mentioned here: 1) Wrap one around your disposable shaver that you use in the shower (ladies) so you'll have a good grip even with soapy hands. 2) To keep a casserole dish and its lid together while transporting to a potluck: Using two rubber bands, wrap one around the handle of the lid and one handle of the dish, then wrap the other around the the handle of the lid and the other handle of the dish. Re #36, no need for a rubber band. If you have animals or small children who unroll the toilet paper, simply put it on the holder so that it unrolls from the back. A paw or a small hand will roll it forward. I'm a fidgeter. I like to keep a rubber band on my desk just to wrap around my fingers and to fidget with when I need to keep from tapping my fingers on the desk or bouncing off the walls. I can vouch for #13! I can now close my teeth together. It's fantastic. These are some cool things you can use with a rubber band! A Bookmark and Page holder. Works perfectly and frees up your hands all you need is two regular sized rubber bands. Thanks I've hot heaps of spare rubber bands to use! My husband doesn't see well so in the shower I put a blue band on the shampoo and a red one for the conditioner. My favorite rubber band hack is to wrap a thick band several times around a plastic soda bottle cap to make it so much easier to open. I have carpal tunnel syndrome and my "twister" wrist is weak...this really helps!